France's ailing Socialist Party lost another heavyweight on Thursday after Foreign Minister Jean-Yves Le Drian announced he was quitting the party which was chased from power last year by centrist President Emmanuel Macron. Le Drian's membership of the party had come into question in recent days. A number of senior Socialists had called on the 70-year-old political veteran to choose between the opposition benches and the government. 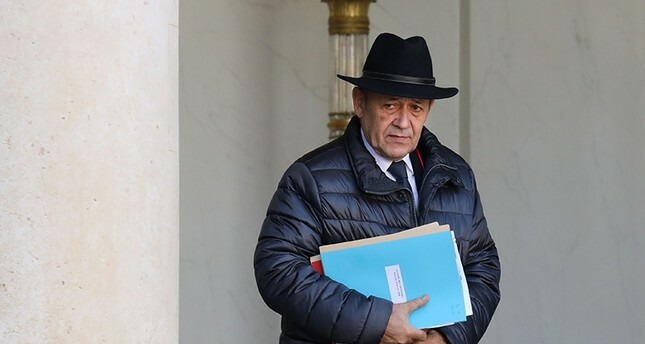 Le Drian, who served as defense minister under former Socialist president Francois Hollande before switching his loyalties to Macron, told Cnews television he had heard their calls. "I am leaving the Socialist Party with a great deal of emotion, as a member for 44 years, and also with a lot of pride, having been involved in the campaigns of (former president) Francois Mitterrand, (former premier) Lionel Jospin and Francois Hollande with whom I am still close friends," he said. Le Drian's departure is another blow to one of France's oldest parties which voters deserted en masse last year after five years of lackluster rule by the unpopular Hollande. Le Drian faulted the party for what he called a "sectarian, sterile" approach in failing to back Macron for president over the Socialists' own leftist candidate, contrasting their stance with that of Germany's Social Democrats who have agreed to form another coalition with Chancellor Angela Merkel's conservatives. He, however, ruled out joining Macron's Republic on the Move (LREM) party, which has attracted a slew of defectors from both the Socialists and right-wing Republicans. His announcement came a day after four candidates for the leadership of the Socialists faced off in a TV debate. The favorite is Olivier Faure, who heads the Socialist group in the lower house of parliament.